There are hundreds (if not thousands) of iPhone cases on the market today. From “barely there” slim plastic wafers to industrial strength monsters that can survive a drop from 10,000 feet, there’s seemingly something for everyone. 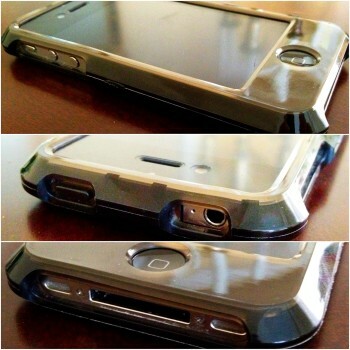 And yet, the folks at CellPig believe there’s room for one more, and following a successful Kickstarter campaign they’ve launched the cellhelmet case for iPhone 4/4S in the US and Canadian markets. The cellhelmet case itself is made from “a dense polyurethane rubber (TPU) shell with angled edges for drop-shock displacement around the device” that comes in either a smoke or clear colour. 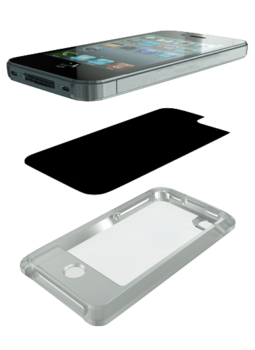 It also includes two interchangeable PVC backplates for glass protection and personalization. The case I received came with the black and white backplates, however additional colours are available when ordering. While the case is fairly hefty, it’s not enormous like some other protective cases, yet it feels substantial enough that you should have a sense of security if your iPhone takes a tumble. The case surrounds your device on all sides and the back, with openings for volume/mute, headphone/speakerphone, home button, camera/flash, and dock connector. If you wish to use the PVC backplate, you simply insert this into the case before inserting the iPhone and you’re good to go. Note that this is a case you’ll want to leave on, as removing the phone takes a bit of effort. On the plus side, there’s no way the case will fall off the phone. What really differentiates the cellhelmet offering is the fact that, aside from getting a durable protective case, you’re also getting 1 year of accidental damage coverage that covers your device once you register it with the company (US and Canada only). Coverage starts as of the date of purchase and you must register your coverage within 30 days. 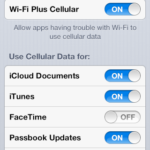 Coverage is only applicable to the device originally registered, and you must provide your carrier name, device model and IMEI number when registering. If you do manage to accidentally damage your iPhone (water damage not included) within 1 year while using the cellhelmet case, you can submit a claim, pay a mandatory $50 USD handling fee + shipping, and your device will either be repaired or replaced as appropriate by the folks at CellPig. While I’ll admit I didn’t intentionally drop my iPhone while testing the case, it did take a couple of falls while I was using the cellhelmet that would have resulted in some cringe-worthy moments if the iPhone was “naked”. My infant daughter knocked it off the back of the couch last weekend, and it bounced off her play table before landing on the tile floor (screen side down) at which time my 75 lb Labrador decided to investigate. Under normal circumstances this could have been a potentially screen shattering experience, but with the cellhelmet I was able to rescue it from the dog’s affections, wipe it off, and get back to checking Twitter without further trouble. All in all I was pretty impressed. The only complaint I would have about the case is that they hole for the headphone jack can be a bit tight with certain headphone cables. I have both the Bose OE2 and AE2 headphones, and I had to push the cable quite hard in order to get it all the way into the jack. Another millimeter or two of space would be nice in such instances. 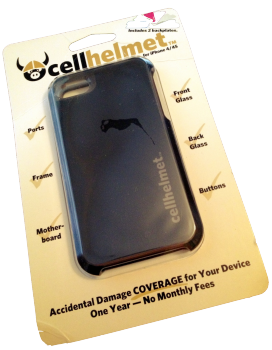 In general, the cellhelmet is a pretty decent case if you’re looking for something durable that offers good device protection with the added bonus of the 1 year of damage protection. It’s not the prettiest case out there, but if you’re accident prone or just have an unfortunate habit of dropping your phone, the cellhelmet case is something you should check out. If you’re interested in ordering, the cellhelmet is available for $44.99 USD at CellPig. Additional information and details on the damage protection coverage can be found on the site as well.